This package contains everything you need to get a server going. When you downloaded the zip file make sure that you goto its properties and "Unblock" it BEFORE you extract the files, else it may not function correctly. There is a folder called "prerequisites" and you must run and install the vcredist_x86_2012.exe and vcredist_x86_2013.exe and also the dxsetup.exe found in the dxsetup folder or your server will not run. Also edit the svrcfg_cnc.ini found in the data folder to set your own server name, title, and maybe some other options. Brenbot is included in this zip and works 'out of the box' pretty much. You should however change the nickname of the bot to use on IRC, the channels it will join and the Path to your Server root folder. See moderators.cfg for help adding moderators. 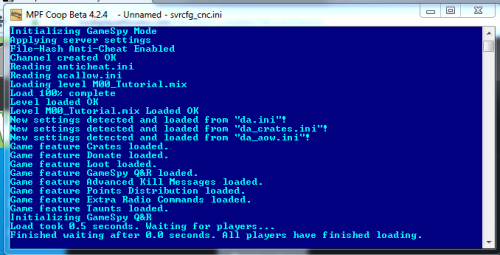 The FIRST message listed in messages.cfg is what will be displayed when players type !rules in your server. Keep it very short as there is a ~200 character limit on lines. I've included an example configuration of the tt.cfg file that now handles the server map rotation and downloader properties. A note: When you use the packageeditor cmdline to install or convert new maps or packages make sure the Server is NOT running. Always start the server first, then brenbot. The sourcecode based on Dragonade 1.92 with TT 4.6 support is included and contains a nice mpf_example to get going. You need both Visual Studio 2012 and Visual Studio 2015 installed. You can get VS2015 Community Edition off Microsoft's website. However, there is no community edition for VS2012. After installation it is highly recommended to upgrade to TT SSGM 4.x. This is a server-side game manager for the Renegade FDS. It includes a wide variety of features such as additional logging, gamespy forwarding, weapon and powerup drops, new game modes, crates, vehicle shells, vehicle purchase queueing, and much more. The source code is included and you can build your own plugins using the built in event system or use existing SSGM plugins. Created by @Whitedragon and Black-Cell.net. Note: This particular VC2015 Solution for the Source Code was made by dblaney. where you can fight together with other players against bots on the Single Player Mission Maps. Source levelfiles for M08, M11 and Skirmish00 are included.